Former Museums and Heritage Studies student, Amy Hackett, profiles New Zealand's First World War entertainment troupes and concert parties. The Digger Pierrots in 1917. Image courtesy of the Alexander Turnbull library, Ref: 1/2-012913-G.
Entertainment troupes and concert parties had an important part to play during the First World War. Performing songs and ballads, comedy sketches, costumed revues and pantomimes, entertainment troupes and concert parties provided much needed relief for soldiers on active service. Not only would they prove useful in momentarily distracting the soldiers from the harsh realities of war, but often performances would address some of the grievances soldiers were feeling at the time. This could include the endlessness of war or the lack of leave, and often targeted those in positions of authority. Troupes and parties would perform at base camps, as well as touring to nearby camps and hospitals. In some cases, they even provided entertainment to weary civilians too. The first of New Zealand’s concert parties was the Kiwis. Formed in late 1916 by Major General Andrew Hamilton Russell, commander of the New Zealand Division, the Kiwis were a way to keep soldiers' spirits high after the large losses at the battle of the Somme. By the end of the war there were at least five concert parties attached to the New Zealand Division touring Europe, including the Kiwis, the Tuis, and the New Zealand Pierrots. 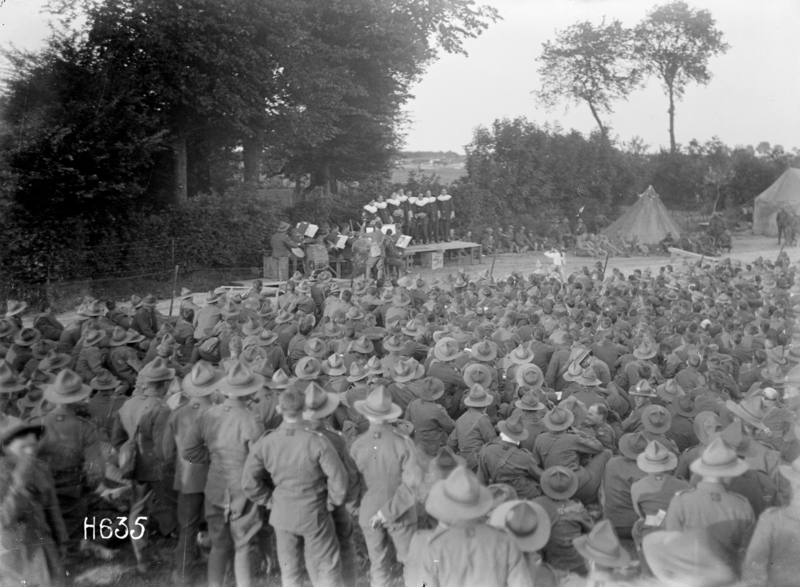 A view over an audience of soldiers towards the army entertainment troupe the Kiwis and their accompanying orchestra. Photograph taken Louvencourt 3 June 1918 by Henry Armytage Sanders. Image courtesy of the Alexander Turnbull Library, Ref: 1/2-013242-G.
Entertainment group the Digger Pierrots in costume with jackets featuring large silver ferns. 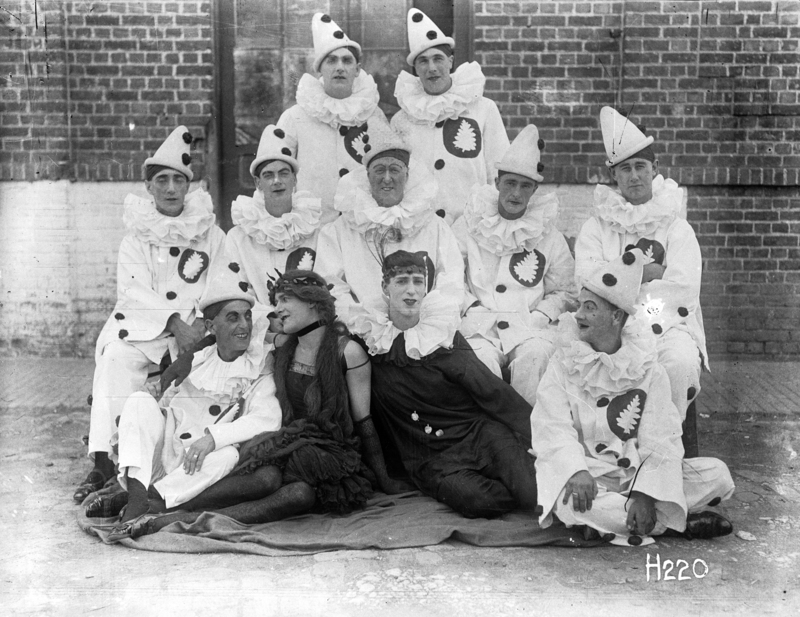 The Pierrot in the centre of the second row has been identified as Dave Kenny, and the Pierrot at far left middle row is possibly Theodore Tresize. Photograph taken 25 August 1917 by Henry Armytage Sanders. 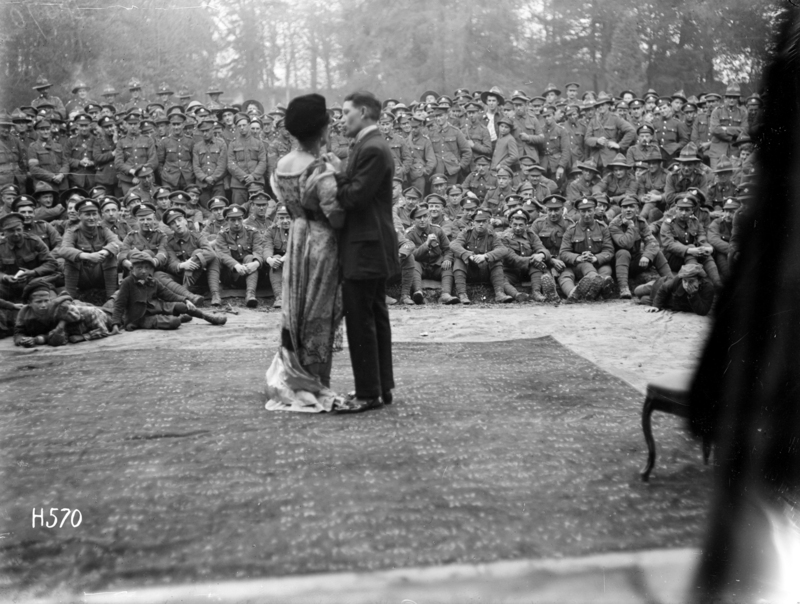 Image courtesy of the Alexander Turnbull Library, Ref: 1/2-012913-G.
Two actors share a romantic moment in an open air performance by the Pierrots of a neighbouring Division and largely attended by New Zealand soldiers. Photograph taken 1918 by Henry Armytage Sanders. Image courtesy of the Alexander Turnbull Library, Ref: 1/2-013184-G. Many concert parties continued to perform after the end of the war, often raising money for returned soldiers funds and other similar causes. Another New Zealand troupe, The Digger Pierrots, returned from the war to tour New Zealand in 1919 and Australia in 1920, giving people back home a taste of the entertainment their sons, husbands, and brothers had received while on active service. They remained one of the most popular revue companies in Australia until the 1930s when they disbanded. The importance of concert parties and entertainment troupes in boosting morale for soldiers was not forgotten and the tradition continued in the Second World War. Of the various concert parties formed, the Kiwi Concert Party performed for New Zealand troops in places like North Africa, Crete, and Malta. Nugent Welch's paiting of the New Zealand Divisional Open-air Theatre at Authie, from c.1918. Image courtesy of the National Collection of War Art, Archives New Zealand. Reference: AAAC 898 NCWA 412.